4.7 out of 5 based on 283 ratings. The Old Guitarist by Pablo Picasso was painted in 1903, just after the suicide death of Picasso's close friend, Casagemas. Picasso's “Blue Period” spanned the years of 1901–1904, and was followed by his “Rose Period”. Pablo Picasso The Old Guitarist is also notable for the ghostly presence of a mysterious image painted underneath. It is very likely that Picasso originally started painting a portrait of a woman, who appears to possibly be seated, and in an upset or worried mood. Not much of this image is visible except for her face and legs. 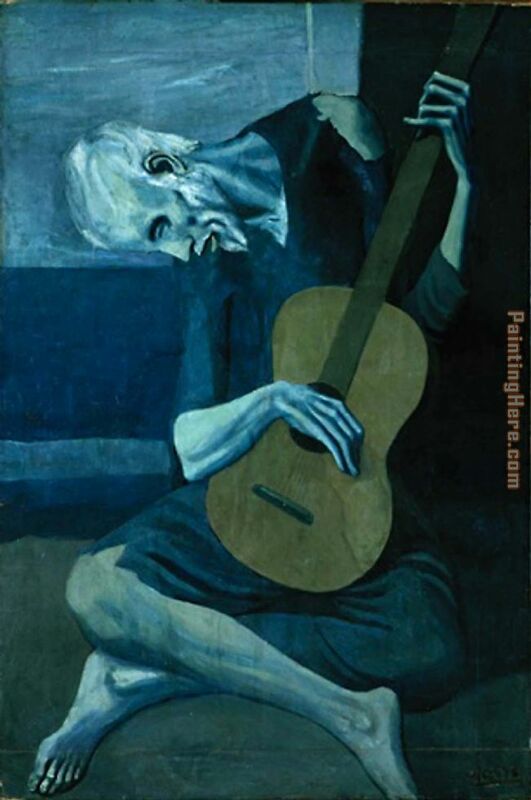 This Old Guitarist painting is currently located at the Art Institute of Chicago in the Helen Birch Bartlett Memorial Collection.The Man with the Blue GuitarWallace Stevens penned the poem “The Man With the Blue Guitar” after viewing The Old Guitarist painting, though in the poem the guitar, rather than the man, becomes blue. The blueness here becomes an image of the transformative power of art, as expressed in the opening lines.The man bent over his guitar,A shearsman of sorts. The day was green.They said, "You have a blue guitar,You do not play things as they are. "The man replied, "Things as they areAre changed upon the blue guitar. "And they said then, "But play, you must,A tune beyond us, yet ourselves,A tune upon the blue guitarOf things exactly as they are." Beautiful, original hand-painted artwork in your home. Interpreted paintings based on the masters' works of Pablo Picasso.This The Old Guitarist needs about 14 - 16days for production by a talented artist. If you're not happy with Pablo Picasso The Old Guitarist that you made on PaintingHere.com, for any reason, you can return it to us within 50 days of the order date. As soon as it arrives, we'll issue a full refund for the entire purchase price. Please note - PaintingHere.com does not reimburse the outgoing or return shipping charges unless the return is due to a defect in quality. If you want to purchase museum quality The Old Guitarist at discount price, why not give us a try? You will save a lot more! This Pablo Picasso The Old Guitarist needs 14 -18 days for production time frame. We ship all over the world. We can provide The Old Guitarist Painting stretched canvas and large framed art.